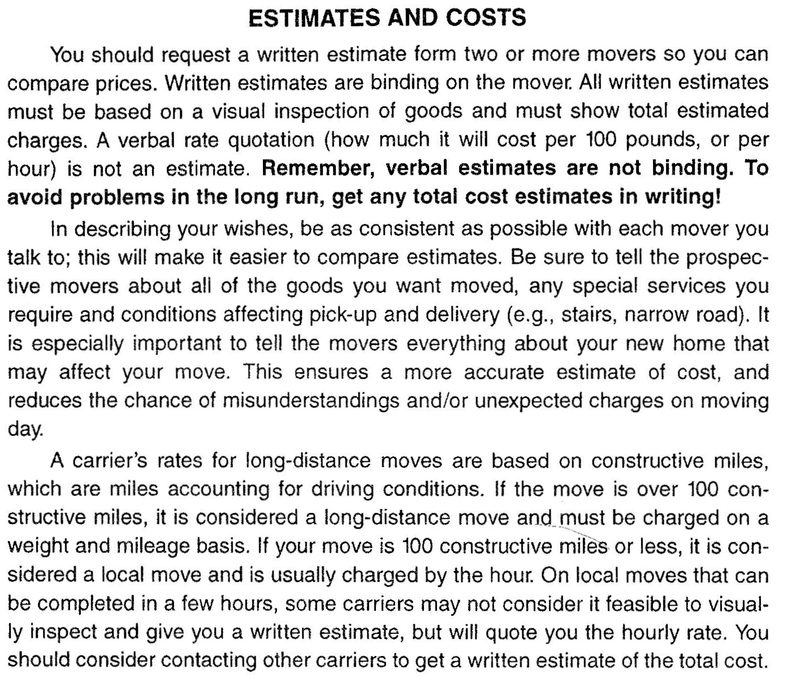 If my move is in California, and it's around 150 miles, which rates should be used? Local or Long Distance? 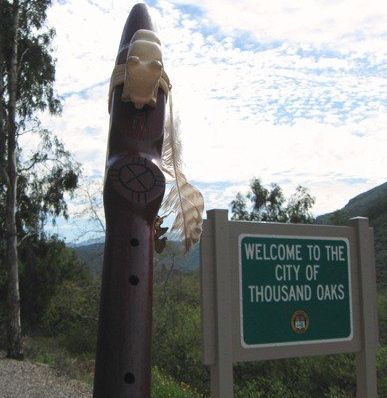 California PUC, is clear that every move with a distance of over 100 miles is considered long distance. However, some customers may benefit from local rates. Therefore, our estimators can work on both tariffs, you may choose the lowest one. By law, we still will weigh the truck, but will discount difference from the final cost. This way we stay compliant with PUC, at the same time provide customer with lower rate! 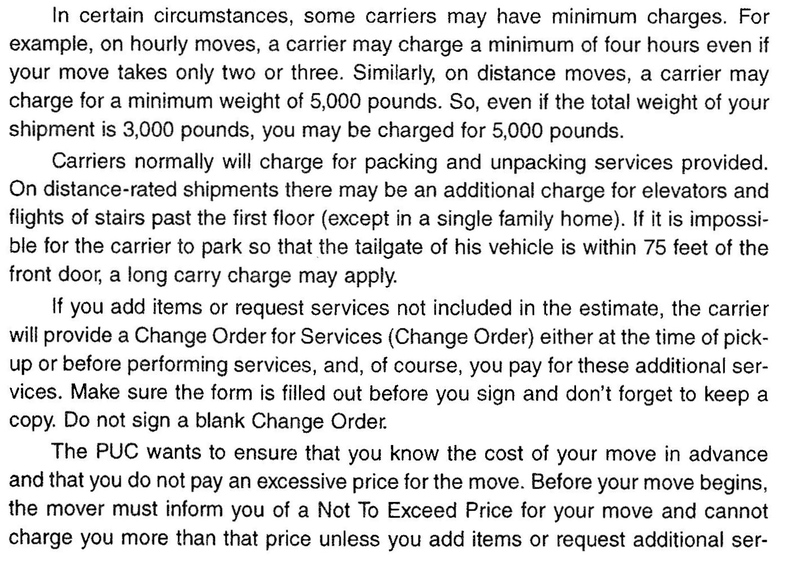 What is the mover's liability over my shipment? 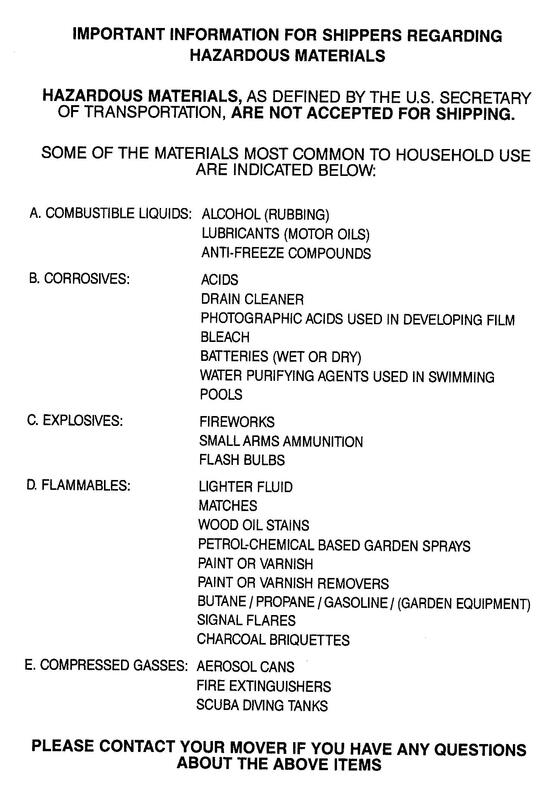 Here is a list of hazardous materials that movers are not allowed to transport with household goods. size range of (15" x 12" x 10"). Size range of (15"x 12"x 9"). For packing books, collectibles and small/light manufactured items. Size range of (18"x 15"x 12"). For packing larger books, files, collectibles, almost all non-breakable kitchenware. (Do not over pack). Size range (24"x 16"x 17"). 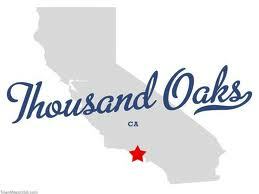 For shipping, storing linens, pillows, collectibles, larger plastic dishes, metal serving platters, plants, and lamps. Size range (24"x 24"x 16"). Size range (24" x 18" x 24"). For shipping fragile articles: china, glasses, dishes, bottles, etc. Double Strength Carton. Specifically made for transportation of fragile, expansive articles. Excellent box for protection of wall art, mirrors and pictures. Lamp needs to be disassembled and top and bottom packed separately. 5 Boxes Per Bundle - (20" x 20" x 48"). Double Strength Carton. Can be used over and over again - Great for storing winter & summer clothes too! Our Heavy Duty Boxes ensure your clothes won't sag before you do on your next move. Each Wardrobe Box comes with a sturdy metal hanger bar. TV-Boxes,Heavy-duty-(72"x8"x42") Double wall box perfect for packing any flat screen TV between 56" and 70". Includes 6 Double Wall corrugated sleeves to protect your Television. Wrap your TV in 65' large bubble wrap before packing. TV Moving Box Up to 55"
Double wall box perfect for packing any flat screen TV between 30" and 55". Includes 4 Double Wall corrugated sleeves to protect your Television. Wrap your TV in 65' large bubble wrap before packing. TV Moving Box Up to 29"
TV-Boxes,Heavy-duty,(30"x8"x22") Double wall box perfect for packing any flat screen TV 15" to 29". Includes 2 Double Wall corrugated sleeves to protect your monitor. Wrap your TV in 65' large bubble wrap before packing. Bundle - (30 lbs of 24"x 36") ink-less paper roll. Great for protection of fragile items and filling in empty space when your packing boxes. Great protection from dirt, scratches, dust, and stains. Available for any size mattress or box spring and possibly other large items. It comes sealed on three sides - seal the top with tape. Full-Size Mattress Cover - (54" x 8" x 90"). 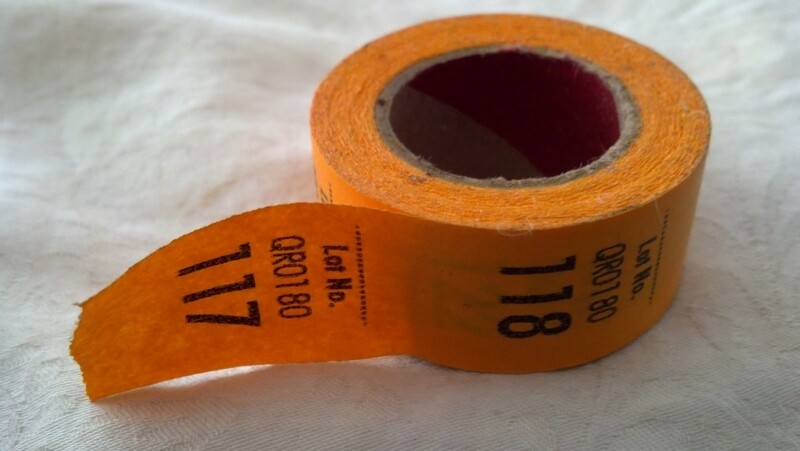 6 roll bundle - Provides 650 yards of tape. Seals about 100 medium boxes. Very strong and durable product. Excellent for moving and protecting glass and other fragile articles: electronics, expansive china, glass furniture, antiques, etc. Roll - (18"x 1000' long). Protects against scratches, dirt, dust, and holds items tight, keeps the integrity of the construction if properly wrapped. Excellent for sofas, tables, dressers, file cabinets and a lot more. •	Pack one room at a time, labeling each box with a description of its contents and its destination (e.g., kitchen, bathroom). Be as specific as you can; it will make unpacking that much easier. •	Keep the weight of your boxes reasonable. If possible, put heavy items in small boxes to make them easier to carry. •	Don't apply tape directly to polished or painted wood finishes. Removing the tape could ruin the surface. 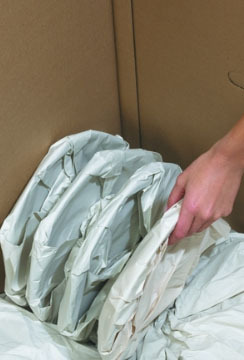 •	Double-box fragile items and add plenty of cushioning. What is an average size/weight of my residence? Long distance moves are charged by the weight of the shipment. Here is a table of average residence. To get a better idea get a written estimate. On the move day movers will weigh the truck. The movers will put numbered stickers to each items/box and log them into inventory reports, along with the condition of the items. 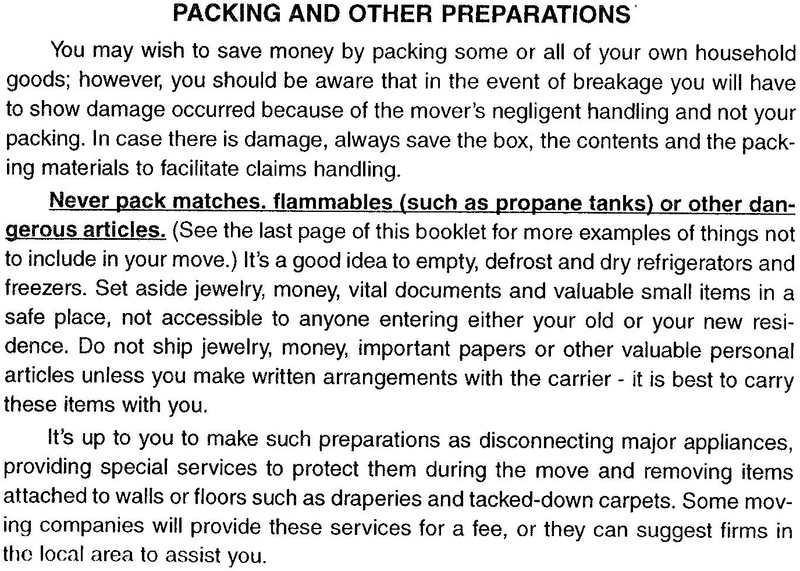 If you packed your boxes yourself, movers will indicate it on the report as PBO CU - Packe By Owner, Condition Unknown. That's why we incourrage our clients to have our movers packe all fragile items. 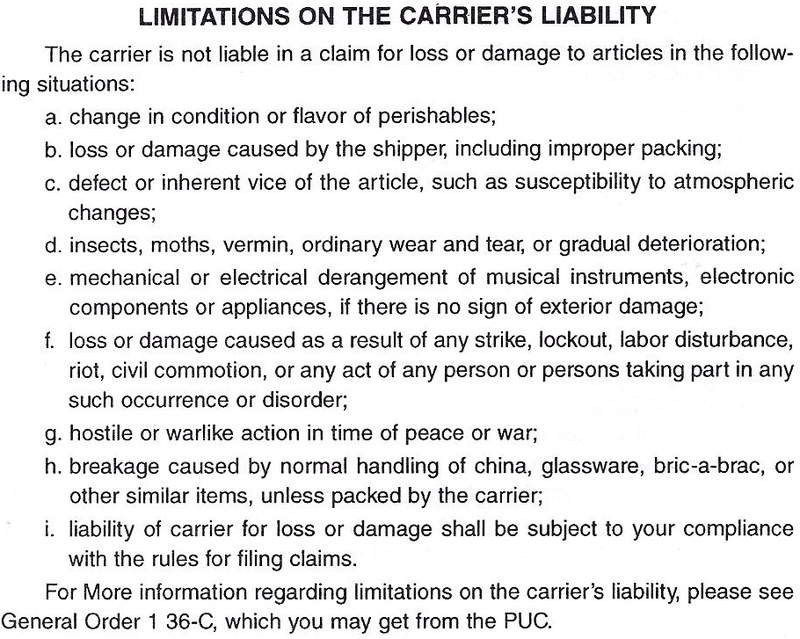 In case of damage or loss it's much easier to prove movers liability. How do I know find out the real weight of my shipment? If I am moving into storage how big of a unit will I need for my residence? To receive an accurate quote please get an onsite quote. Here is a talbe of average sizes. What kind of methods of payment available to me? What do I do if mover damages some of my goods? If the damage is to packed item, you should retain the box and it's contents and packing materials. This is especially important if you packed boxes yourself. Since you will have to show that bad packing was not the reason for the damaged items. Providing copies of documents such as store receipts for the lost or damaged items and professional estimates for reapir will spead up the process of the claim. 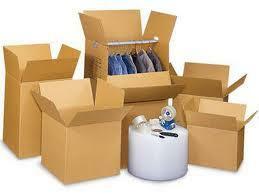 You should also retain all copies of correspondence with the mover. All correstpondence should be made by certified mail. Return receipt requested, to evidence of receipt of the claim by mover. Your claim should be filed, with in 9 (nine) months of the delivery of your shipment. 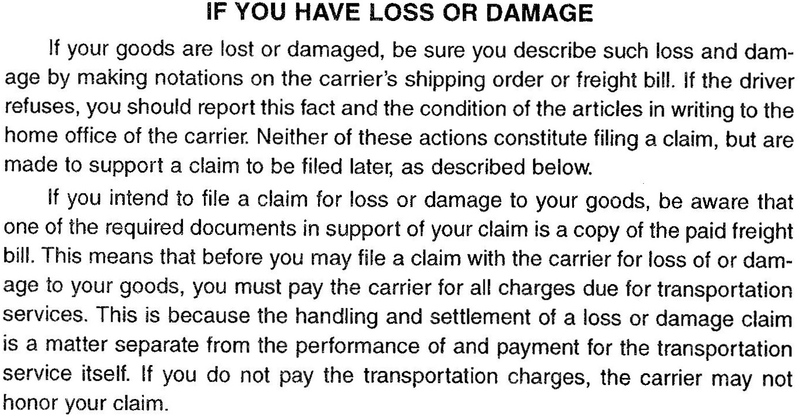 The mover is required to acknowleadge claim in writing with in 30 (thirty) days. 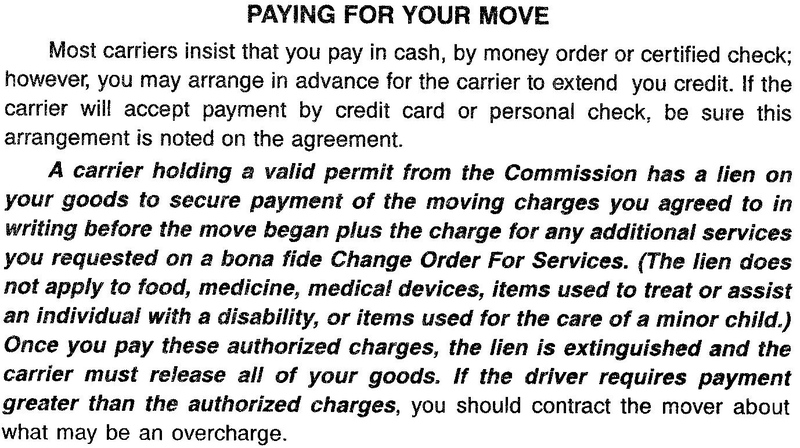 And mover must pay, decline to pay, or make a firm compromise settlement within 60 days within receipt of your claim. If some reason beyond movers control delays action for a longer time, the mover is required notify customer in writing within 60 days as to claims status and the reason for the delay and again every 30 days until the final action is taken.